Summer here in North Carolina is the highlight for many offshore anglers. This is the time of year where you can find many of the biggest names in offshore species such as marlins, sailfish, wahoo, mahi-mahi and the mackerels; Spanish and kings. Summer and especially into fall and winter is prime time to hunt and catch the toothy grinned king mackerel that fishermen spend countless hours trolling for with many tournaments surrounding this menacing fish. There are several reasons why this fish in particular is one of the most sought-after gamefish throughout their range, which consists of our area here in North Carolina all the way to the shores of Texas. North Carolina however is one the premiere areas when it comes to targeting kingfish due to our proximity to the nutrient laden Gulf Stream. Anglers travel from all over the nation to fish North Carolina’s waters in search of that smoker king. Kingfish are referred to as smoker kings when they reach around the 30 pound or more size; much like a bull red or gator trout for you inshore guys. All smoker kings will be female as the males rarely reach weights of over 15 pounds or so. 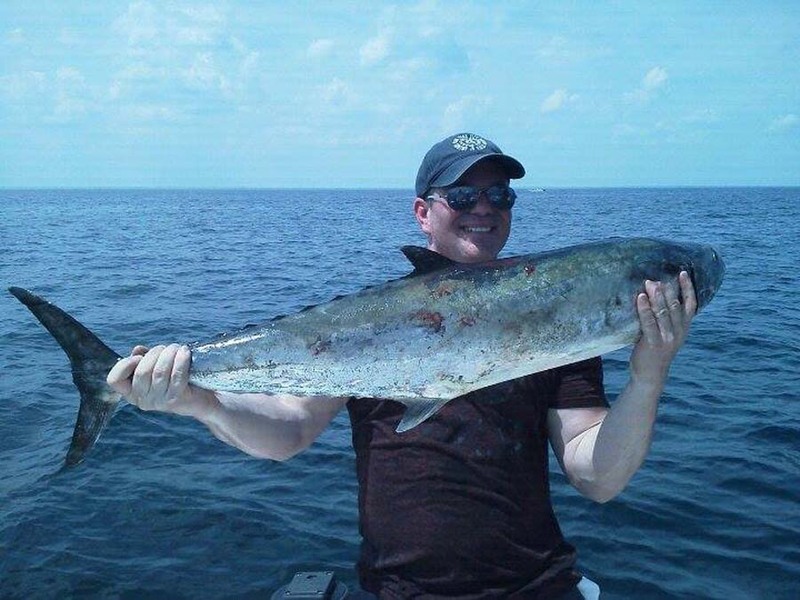 King mackerel are such popular gamefish due to the fact that they can be found nearshore as well as offshore. This makes them catchable by a variety of methods, tactics and from almost any type of watercraft, including paddle crafts. Slow trolling for these big bruisers with live bait, dead bait and a variety of lures and spoons is the most preferred method for enticing a strike. Once hooked, kingfish are known to make blistering long runs while smoking line from the reel. Maybe this is why the big girls are referred to as smoker kings? Regardless of what draws you to chase the mighty king mackerel, one thing is for sure: the waters off of North Carolina are home to giant kings both inshore and off. These next few months should really kick it in high gear so don’t wait to book your trip. Contact Captain Mike Hoffman here at Wilmington.fish Fishing Charters for a one of a kind experience hooking up with the amazingly speedy and toothy king mackerel.